NASA's Kepler space telescope recently discovered 104 exoplanets, including four possibly rocky worlds that circle a red dwarf star called K2-72. NASA's Kepler space telescope has spotted four possibly rocky alien planets orbiting the same star, and two of these newfound worlds might be capable of supporting life. The four exoplanets circle a red dwarf — a star smaller and dimmer than the sun — called K2-72, which lies 181 light-years from Earth in the Aquarius constellation. All four worlds are between 20 percent and 50 percent wider than Earth, making them good candidates to be rocky, discovery team members said. The K2-72 planets are among 104 alien worlds recently discovered by the Kepler telescope during its bounce-back K2 mission. Study leader Ian Crossfield, of the University of Arizona's Lunar and Planetary Laboratory, first announced this haul in January, during a presentation at the 227th Meeting of the American Astronomical Society in Kissimmee, Florida, and the results were just published online in The Astrophysical Journal Supplement Series. Kepler finds alien planets by noticing the tiny brightness dips they cause when they cross their host stars' faces from the spacecraft's perspective. This work requires incredibly precise pointing — an ability Kepler lost in May 2013 when the second of its four orientation-maintaining reaction wheels failed. However, Kepler team members soon figured out a way to stabilize the telescope using sunlight pressure and the two remaining reaction wheels. 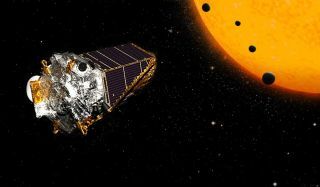 In 2014, Kepler embarked on a new mission called K2, during which it is observing a variety of cosmic objects and phenomena, including exoplanets. But Kepler's planet hunt is quite different this time around. Whereas the observatory stared continuously at one small patch of sky during its original mission, Kepler is now peering at different regions during a series of 80-day "campaigns." "An analogy would be to say that Kepler performed a demographic study, while the K2 mission focuses on the bright and nearby stars with different types of planets," Crossfield said in a statement today (July 18). "The K2 mission allows us to increase the number of small, red stars by a factor of 20, significantly increasing the number of astronomical 'movie stars' that make the best systems for further study." Kepler has now discovered more than 2,300 alien worlds since its March 2009 launch — about two-thirds of all confirmed exoplanets found to date. More than 2,000 additional Kepler "candidates" await vetting by follow-up observations or analyses.